The tough Kentucky soils can cause problems for home foundations. The soil combined with the climate can cause foundations to crack and settle over time. 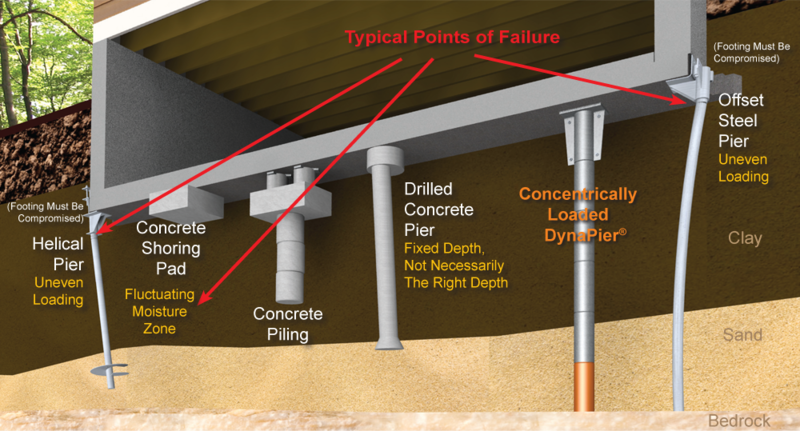 At Best Waterproofing, we use DynaPier® foundation piers to repair home foundations. The DynaPier® has several distinct advantages over the competition that they just can’t match. The DynaPier® works no matter how tough the soil is. For homeowners that need foundation repair it is important to learn about the foundation repair company that you want to hire, as well as the types of piers the company uses. After all, these piers are going to protect your biggest investment. For example, the DynaPier® is one of the only piers on the market that is constructed of both concrete and steel. It uses the strength of both to create a super pier. Second, it is installed directly beneath the foundation, which means that the foundation will not be weakened by drilling into it. Several companies drill holes into the footing which can compromise the structural integrity of the footing. Another huge benefit is that the DynaPier® is pressed all the way to bedrock or hard strata, once it reaches the point of resistance. This means that the pier is pressed until it can’t be pushed any further. Most other companies use piers that rely on the friction from the soil to hold them in place. When the soil shrinks and expands due to weather conditions these piers settle and so does the house they’re supposed to be holding up. Call us for a free home estimate.